Make your doll a cute blouse for the cooler weather of fall and back to school. The School Bell Blouse is a simple, but stylish long sleeve shirt that is perfect for playing in the leaves or an afternoon at the mall. Pretty pleats above the wrist give the sleeves a "bell" flare. Dress up the look with a classic Sixth Grade Skirt or dress it down with a pair of Playground Pants. With an open back hook and loop close, it's easy on and off for little hands. 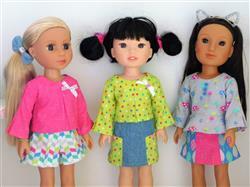 Use fun cotton prints or girly lace to stitch up a whole wardrobe of cute blouses for your doll. Choose a cute peplum skirt or a simple flared hem (longer length or crop top style) with a pretty, neckline pleat. Embellish your blouse with bows, flowers, and buttons for a look that is all your own. The long sleeves feature a high wrist flare while still keeping your doll warm and in style for cooler weather. Like all of my patterns, this pattern offers a great "learn to sew" starting place for beginner seamstresses or young girls that want to learn to sew for their dolls. This pattern is also nice for an experienced seamstresses to make a basic doll wardrobe, with lots of mix and match options. This classic but simple top is very easily made from a quarter yard of fabric (quilter's fat quarters work great!) in a woven cotton or other lightweight fabric. Mix and match your fabrics and trims for unlimited design options. This pattern was specifically designed and tested on 14.5 inch dolls such as WellieWishers™ by American Girl®. My dolls have a waist measurement of 6 inches. Please measure and test the fit on your own doll as there are many on the market and it may not fit the same on all of them. The School Bell Blouse pattern is available in 3 sizes: designed to fit 18" dolls such as American Girl®, designed to fit 14.5" dolls such as WellieWishers™ and sized to fit 16" Disney® Animators' dolls. Recommended Fabrics: quilter's cotton, lightweight cotton, eyelet, seersucker etc. I was fortunate enough to be able to test this stylish pattern. So far I've made 3 versions, for both Wellie Wishers and Glitter Girls and they're a great fit, quick to sew with clear detailed instructions and depending on you're fabric choice this pattern is suitable for any occasion. I'm now currently planning to use it to make some Christmas outfits.